Drying herbs, and keeping their flavor and medicine intact, is a bit tricky in the damp Pacific Northwest. Herbs need to be dried as quickly as possible with low heat. 90 – 95 degrees F. is perfect. Too high heat and you run the risk of quickly drying the outside of the plant with the inside still containing moisture. This means plant material that will decompose and mold from the inside out, and the medicinal and nutritional value will be lost. Ovens and microwaves destroy the medicinal and nutritional components of plants. The lowest setting on an oven is typically 170 degrees F., which is much too high a heat for drying plants. Pinterest is chock full of pictures of oven and microwave drying plants, but Pinterest is not the real world, is it? In areas of the country where it is moist a good deal of the time, such as Western Washington, hanging herbs in bunches is not a good choice. While hanging herbs look romantic and pretty, these bunches tend to dehydrate during the day, re-hydrate as the dew falls in the evening, dehydrate somewhat during the next day, re-hydrate as the dew fall the next evening and so on. With this method, you will lose the medicinal and nutritional value. What to use for dehydrating plants and food? A dehydrator with a fan and heat control is best for our area. The dehydrators with the heat rings on the bottom of the device dry unevenly and the screens need to be constantly shuffled. This means patchy drying and the potential for mold and rapid degradation. The fan type dehydrators push warm air through all the screens and make for a more even dehydration process. Here is an example of a good dehydrator: Nesco Dehydrators. Personally, I have a very large dehydrator much like the “jumbo” on Dry It, You’ll Like It! ; however, mine has a fan. I find it much more efficient over dehydrators without fans. How long to keep the dehydrator going? Until the plants are what I call “snappy dry.” That means that when you attempt to bend the thickest part of the plant, it snaps. If it bends at all, it means that there is still moisture in the plant and it needs more time in the dehydrator. There are no set hours or days with dehydrating herbs. Roots will take longer than leaves, leaves take longer than flowers. Each plant and plant part is different with its dehydration time needed, so the snappy dry method is best to gauge full dryness. 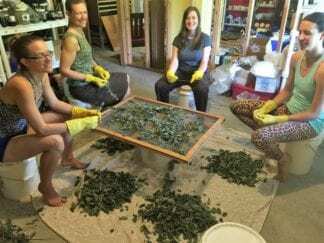 My apprentices frequently show me their 18 hour dried nettles, to which I immediately show them how much more moisture is still in the plant and leaf stems. Snappy dry, my friends, snappy dry. Store immediately. Do not let the plants hang out in an unplugged dehydrator, as moisture quickly re-hydrates the plant material. A dehydrator is used simply to dry plants, not as a place to store them after they are dried. How to store properly dried plants? In glass jars or PET plastic buckets with tight lids. If you are going through all the work to go into the wild or garden, harvest plants, process them and dry for medicine or meals, you’ll want to make sure that they will stay viable for as long as possible. Plastic is permeable. Storing in plastic bags make for dried plants that attract moisture. I’ve read in books where it was said to store dried herbs in paper bags under your bed. What are they thinking? Under your bed with the dust bunnies, cat hair and the like? Not a good idea. Paper also attracts moisture. I keep my herbs in either glass jars if I have a small quantity of dried plants, or for my larger volume tea formulations, in PET plastic buckets. PET plastic is food safe plastic. Keep the jars out of direct sunlight. Sunlight, whether direct or indirect, will bleach your dried plant material, causing it to lose its medicinal and nutritional benefits. How long will dried plants keep their medicinal and nutritional strength? It depends. It’s important to store the dried plant material as whole as possible. Once a root is dried, it is extremely hard to break apart, so please do cut up your roots before drying. Leaves and flowers should be kept whole. A whole plant has very little openings for oxygen, the Great Decomposer, to get in and do its work. When you crush, or break apart leaves and flowers for storing, they become susceptible to quicker decomposition. I do not keep plant material from one season of its life to the next. 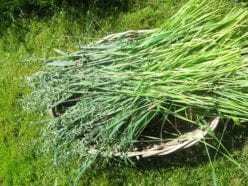 Meaning, if I harvest nettles in the spring and still have some left over the following spring, I use the leftover nettles from the year before for mineral rich compost tea, and harvest current season plants. Because I think you’re all amazing people, I am sharing a couple of my favorite tea blends. The first blend uses garden plants. Late winter is the perfect time to start planting seeds indoors for starts, or dividing herbs for sharing and early spring planting. For you wildcrafters, there is a tea blend for you as well. As the seasons progress, you’ll have opportunities for drying the flowers, leaves, and much later, roots for these blends. I have formulated the tea blends into parts. A part is a measurement such as 1 cup, 1/2 cup, etc. The total volume of the tea blend is up to the person creating it. They can use a teaspoon as one part, a cup as one part, or even a gallon as one part if they so choose. If you, dear reader, choose to use 1 cup as your measurement standard, 1 part would equal 1 cup dried plant material, 1/2 part would equal 1/2 cup dried plant material, 1/4 part would equal 1/4 cup dried plant material, etc. Oats – 2 parts. Throw down oat seeds right on top of the soil and keep moist. In later summer, when the seeds leak out “milk” when squeezed, cut down about a foot to a foot and a half, and dry the leaves, seed heads, and stalk. Oats calm stress and nudge the Schwann cells next to the nerves to synthesize myelin, which is the protective covering around the axis of the nerve cells. 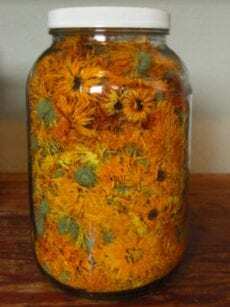 Chamomile flowers – 1 part. Anti-inflammatory and sedative. Spearmint, Peppermint, Lemon Balm – 1 part your choice. The mints are invigorating, mineral rich, and super tasty. Lemon Balm is anti-viral to boot! Calendula flowers – ½ part. Antibacterial, and anti-inflammatory, calendula flowers add sass and color to your blend. 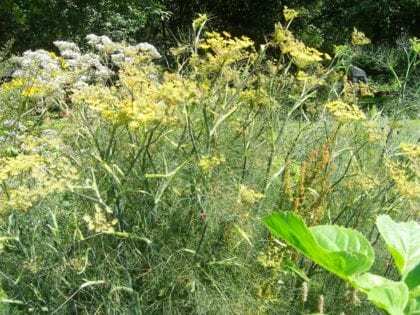 Fennel flowers, leaves, and/or seeds – ¼ part. A good anise flavoring to the blend, fennel helps to expel gas and soothe an overfull stomach. Violet flowers – ¼ part. Violets help facilitate the gradual relief of grief and sadness. 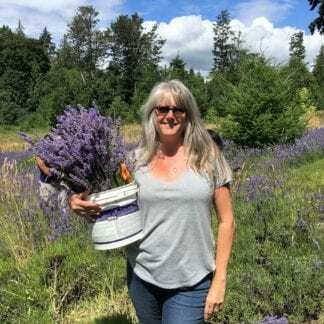 Lavender flowers and leaves – ¼ part. Anti-fungal, anti-viral, anti-bacterial. Lavender helps us to focus, chill out, and kill the bad stuff. Nettles – 1 part. Harvest nettles before they flower. Cut the tops to ensure regrowth. Mineral rich, anti-inflammatory. Do not use nettles during, or to treat, adrenal fatigue, as the stimulating influence of nettles may worsen the disease and cause greater burnout. Dandelion flowers and roots – 1 part. Dandelions improve digestive, immune, and nerve function. Wild Raspberry leaves – 1 part. Wild raspberry leaves help to clear the lungs and support immune function. They are a good source of selenium which helps with slower aging, healthy hair, nails and teeth, less cardiovascular disease, and a whole ton of other stuff! Wild Roses – ½ to 1 part. Like violet flowers, wild roses aid in the relief of grief and sadness. Hawthorn flowers – ½ to 1 part. 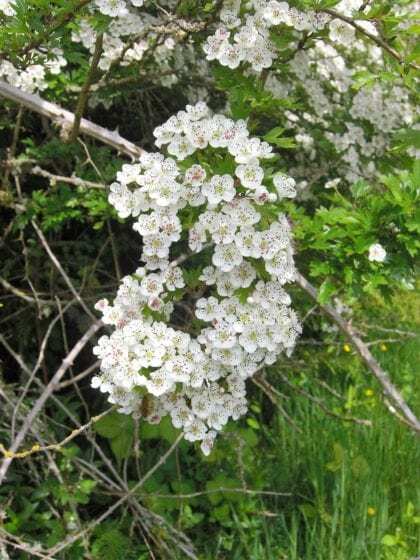 Hawthorn facilitates the movement of food through the digestive tract, dilates the cardiac pathways, and helps a person to feel that “everything will be ok eventually” during hard life transitions. See you around the weed patch! Hi Suzanne I find your information so enlightening to all the blog’s out there. Especially the proper way to make elderberry! I’ve always thought heat destroys the most important parts so makes perfect sense. My question is I want to make an anti inflammatory good for the whole system. My friend gets sore stiff neck. I want something to heal my body I’ve smokes for about 10 years and done all sorts of bad stuff I’m only 25 but feel bloated, sore joints, stiffness and for the first time a few months ago got water retention (that’s when I new I had to make changes) . If I make a turmeric mix would that work best in vodka, brandy, apple cider vinegar and or honey? I’m not keen on the process of oil so which of the other options works best please? Thank you hope to hear soon do I get an email reply? Also I live in Australia lower Blue mountains, climate is eradic, ive started making my own teas what’s the best way to dry if I don’t have a dehydrated can I dry it out in the day and then store in my oven over night (turned off) then back out in daylight? Can I brew tea from fresh fine chopped herbs if I’m using that day? Kudos to you for making healthier life choices! There are many anti-inflammatory herbs to choose from, however, I use fresh plants predominately. Is there willow in Australia? If so, willow is my favorite go to for mitigating inflammation. Please refer to my Plant Medicine Made Easy article, which explains what each menstrua will extract and preserve. As far as drying is concerned, with erratic weather, including dew at night and sun during the day, using a dehydrator is really best. Taking plants in and out of a house during the day and night usually serves to dehydrate and then rehydrate the plants, which makes for the destruction of medicine and nutrition. Hope this helps!